One new and prominent feature in Portland, Oregon is the Tilikum Crossing, which is near the Marquam Bridge. I spent a night there under the Marquam Bridge to photograph the Supermoon in Portland. Tilikum Crossing aka Bridge of the People is a bridge constructed to span the Willamette River in Portland, Oregon. The crossing opened in the fall of 2015 and is designed to withstand a large, powerful Earthquake. TriMet selected the name of the bridge in April 2014 from a list of four finalists chosen by the public. Tilikum is a Chinook Jargon word meaning people, tribe, or family, and the name is intended to honor the Multnomah, Cascade, Clackamas, and other Chinookan peoples who lived in the area as long as 14,000 years ago. The Tilikum name also references the pervasive use of Chinook Jargon in Portland’s first half century in the frequent trade interactions between pioneers and Native Americans. 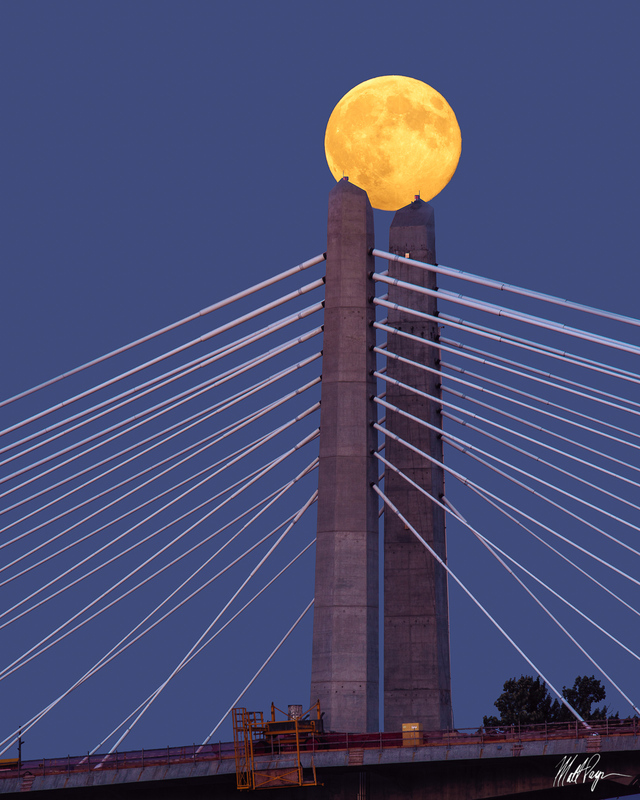 This fine art photograph was taken at blue hour with a large telephoto lens using precise planning and execution to get the moon perched in the perfect spot above the bridge.